Those damn Gremlins have struck again. My PC has lapsed into a permanent vegetative state. I have a techno guy who I habitually haunt. I ring him at work, greet him quite affably with a “Hi, are you okay? So, I’m sat in front of my PC…..” There will be a small, resigned sigh, followed by “Go on…….” Then he will baby walk me through a minefield of headspinning gobbledygook. So I am currently waiting on said techno guy to jump start my flatlining computer. I am letting you lot know as, until then, Jackdaw will only be able to do some short fledgling hops as opposed to longer, migratory flights. I am limited to what I can do on my iPad. Not as many nice, shiny pictures. I could perhaps use a scribe, someone I could dictate to (in a non-Hitler type of way). I think that would be kinda cool. Anyone out there fancy being the Sosthenes to my St.Paul? The Adam to my Chaucer? In a paint-by-numbers sort of way. I once read that Mark Twain’s wife used to go through his work and remove all the swear words. I will make it easier for you-I promise not to pollute your ears with my filthy vernacular. And I will throw in a name check with a few smiley faces. Or emoticons, as those technical people call them. You wouldn’t get that with St.Paul. Charming. Now those are some words that we won’t be able to use. 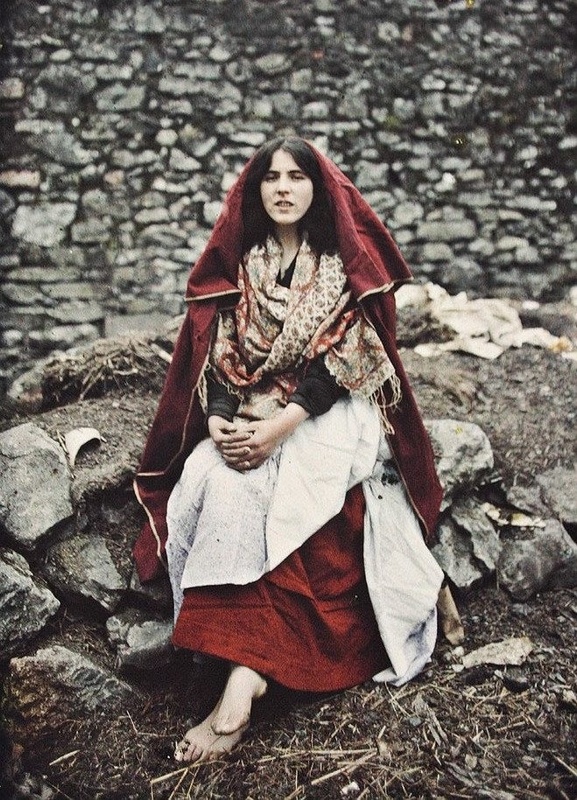 For a period in the late eighties, this very image of this shy, retiring lady adorned the wall of my bedroom. Always playing it cool, showing no interest in me whatsoever. Despite that look. I think I only knew two songs by Transvision Vamp, and I only liked one of those. I eventually gave the poster to a school mate who would cast admiring glances at it every time he called around for a beer….I mean, for us to work on our homework together. My aloof, taciturn ex by all accounts spent the next few years nailed high upon his bedroom wall. The things she must have witnessed. If only she would talk. I think, like me, he didn’t know that many songs by her group either. For twelve months now the Jackdaw has flown, no longer the fledgling that he once was. Riding the high air currents, descending low to roost, his perspective always tinged by his north west habitat. Appreciative always of those cousins who have observed his flight. Those who accidentally entered his territory, and then left. Those who consciously decided to nest in the same tree as he. The migrants and the indigenous ones. The silent trackers and the communicative callers. The Jackdaw appreciates and acknowledges them all. In the dark of dusk he wonders what the future will hold, how he can adapt to an environment that is irrevocably changing. Come the first blaze of dawn he forgets all of this, and takes once again instinctively to the sky. It’s A Date. A Dark, Dark, Date. It’s not often that the wife and I get an afternoon to ourselves. I thought that I would give our stolen hours a brief mention. 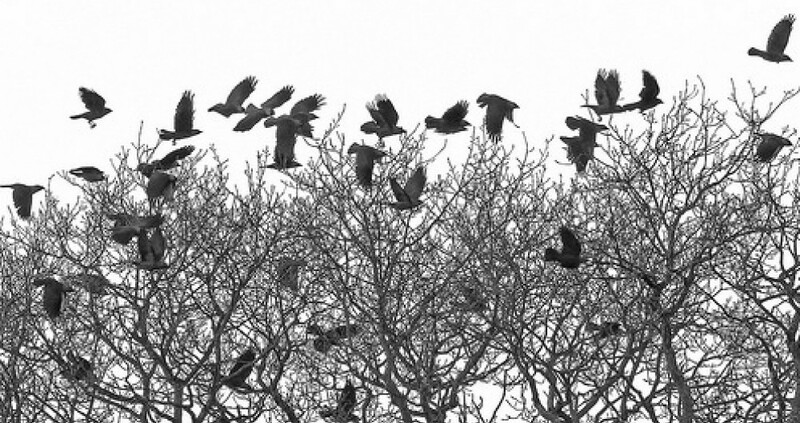 City Jackdaw is not exactly Dear Diary, but Notes On A Life, is, well, just that. We went into Manchester to visit the English Academy that we had recently became a host family for, having had an Angolan student living with us for the past few months. The plan was to make sure that the lad had been attending lessons and not going to the pub each day (I’m joking-we had not been to the place before and just wanted to have a look around) and then go for some lunch. We found the building, cased out the joint, then made our way into Piccadilly Gardens. Breaking with the usual Manchester custom, the sun came out and blue sky hung over us like an old, long absent friend. 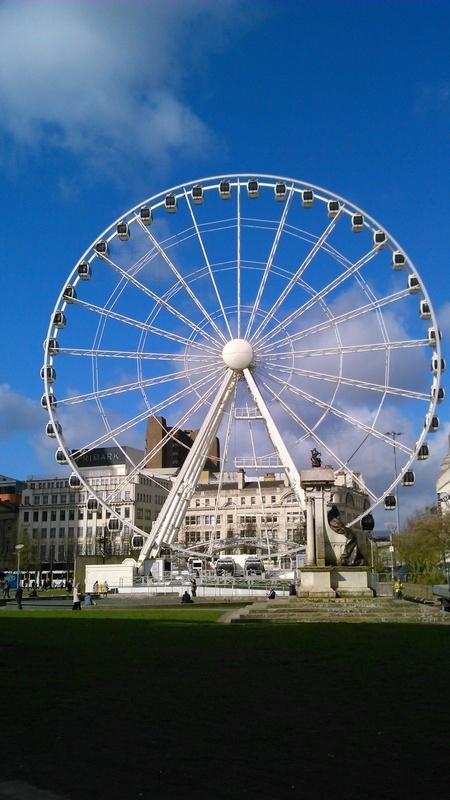 We had been on the Manchester Wheel before, but when it was situated at Exchange Square. Of all the previous visits that we had made into the city center, the day that we had chosen to rise high above the city was not inspired. It was pouring down with rain and the windows were steamed up, so our cataract stricken views were limited. Not wanting to ride that train again, metaphorically speaking, we passed it by and within a few minutes, looming large on the horizon was the National Football Museum. It was like it was meant to be. The perfect place to instil a sense of romance. The perfect venue for a date. Perhaps there was even an area where I could put Jen in goal and take some shots at her? You can see from the photograph that by now more cloud was beginning to gather, and my wife’s mood was similarly beginning to darken. I had a sudden flash of insight-a eureka wave of self-survival. 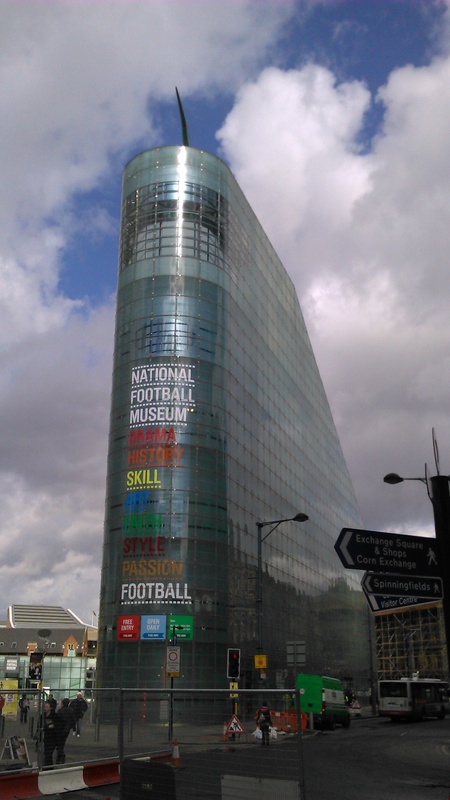 I decided to postpone the football museum for another rainy day. Knowing the way to my wife still being known as my wife is through her stomach, I suggested that we now go for a bite to eat. Jen led me at once into Nando’s, situated in The Printworks. Chicken Chambers turned out to be alright for this sceptical veggie. After this, aware that the clock was ticking and that the kids would be revving up their engines at school and Gran’s house respectively, we walked back to the car which was parked just on the city center limits. Above us the perennial battle between the powers of light and darkness went on. By the time we reached the car park, just one day after the Spring Equinox, we were assailed by a storm of cold, hard hail. 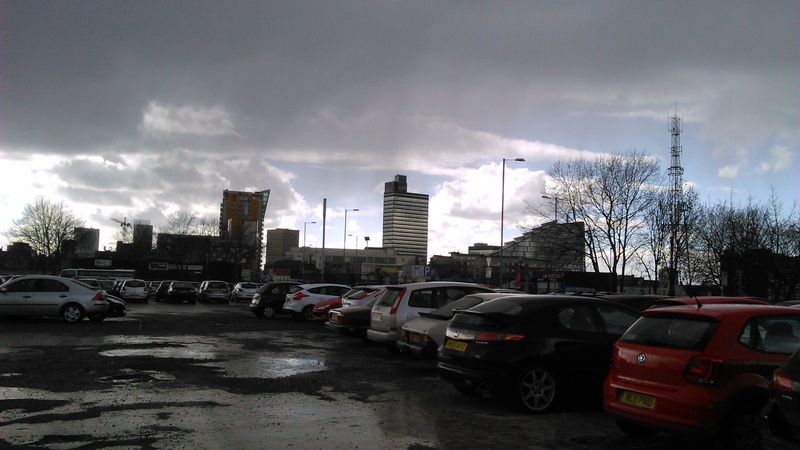 The customary, familiar Manchester sky had returned. You guys know what I’m like with old photographs. I came across these three when writing my ‘Claws For The Weekend:Admissions’ last Friday. Although that was a light-hearted post, this is an altogether darker post, if not a little disturbing. 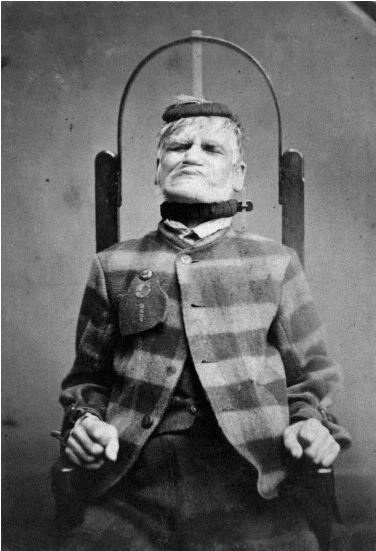 This first photograph is from around 1869, and was taken by Henry Clarke of a patient in a restraint chair at the West Ryding Lunatic Asylum in Wakefield, Yorkshire. Does this old man have an air of defiance, or of being subdued, about him? Or was he incapable of experiencing either feeling? 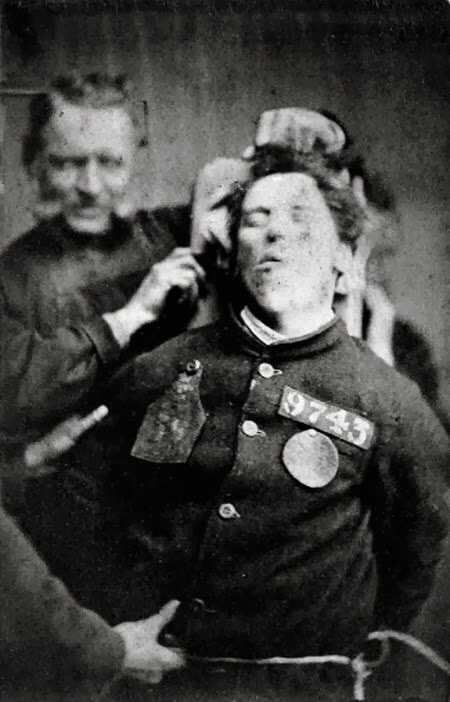 This is another photograph by Clarke, from around the same time, of a patient being restrained by warders. I know that sometimes restraining patients was done for their own safety, or for the safety of others, but there is something about how he is being held by the hair to be captured by the camera that is disturbing. 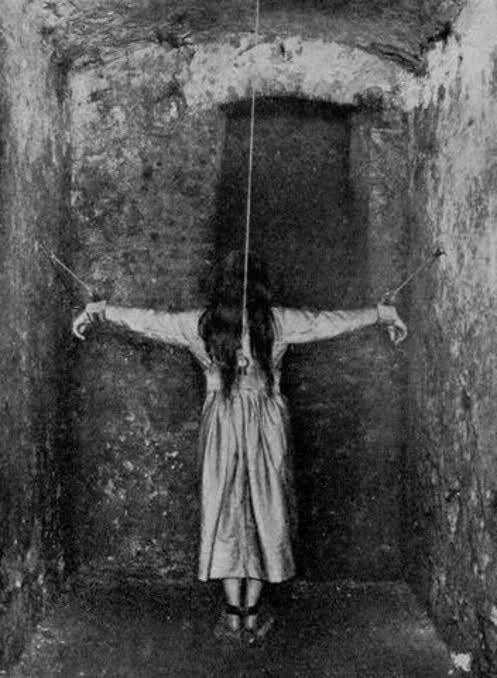 This last photograph, of which I know neither the photographer nor the location,shows a seemingly isolated patient in restraints. Looks like a still from a horror film doesn’t it? My wife worked for a while in a psychiatric hospital. And even though she and colleagues were trained on how to restrain patients for the safety of everyone concerned, the term used was ‘care and restraint’, with the emphasis on care. Thankfully today, the practice is, or should be, done in a more dignified manner for everybody involved. Yesterday the annual Manchester Irish Festival, St.Patrick’s Day Parade took place. Every year it seems to get bigger in both size and popularity. Alas, I did not attend as I went on a windswept walk-more on that later. I just wanted to wish all of you Irish people out there, and all of the people with Irish roots (including the millions of people here in Britain, many ignorant to the fact) a Happy St.Patrick’s Day. In researching my family history, I have uncovered four different Irish branches on my own tree, up to now, so I will lift a Guinness today in acknowledgement of their struggle and to the contribution that they made to me just being here today. A few days ago it was the 71st anniversary of this little girl’s death, so I decided to reblog this. Her face still haunts me.